WARNING: This article contains SPOILERS for Solo: A Star Wars Story. So, when does Solo: A Star Wars Story take place in the original Star Wars movie timeline? And just what age is Han Solo supposed to be in this prequel origin story? You would think that the answers would be clear to even casual fans and general audiences by now. But you would be wrong, since the final scenes of Solo are likely to have fans wondering if their hero is now months, years, or decades away from beginning his part in the original Star Wars: A New Hope. The reception to the film means that the odds of a Solo sequel or Boba Fett spinoff movie have never been worse, but that doesn't change the impact of Qi'ra and Darth Maul's new partnership on the overall movie storyline. No matter what the future holds, if you're unclear on where Solo is set in the larger timeline, and how many years before Harrison Ford this story is meant to be, our explanation should clear up any confusion. It's not easy to discern how old Han is actually supposed to be in his own origin movie, since it a) stretches across a span of three years, b) has the actual age of the actor to contend with, and c) the age of Han in the original movies is never stated outright. But according to the timeline established in Solo: The Official Guide, Han first falls in with the White Worm gang on Corellia at the age of just eight years old. When the movie begins, he is around the age of 19 years old as the drama breaks out leaving behind the White Worms and joining up with the Imperial Navy to pursue his dream of becoming a pilot. The film itself makes a bit of a time jump, leaping forward three years to the point that Han has been booted out of the Navy and into the Army, and stationed on Mimban. He's 22 years old for most of the movie from that point on. 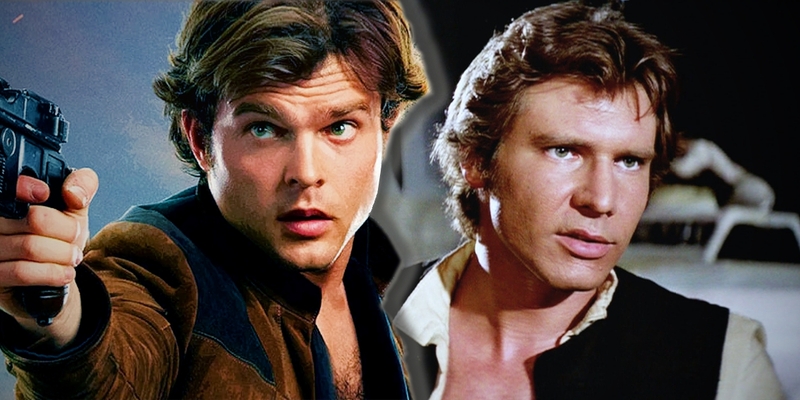 As for actor Alden Ehrenreich, he's currently 28 years old, just five years younger than Harrison Ford was when he filmed the original Star Wars. Which... is where things get a bit confusing. The actor playing Han Solo may only be a handful of years younger than Harrison Ford in A New Hope, but according to the official Star Wars timeline, the events of Solo: A Star Wars Story end exactly ten years prior to the first film in the saga. That might actually seem like longer than audiences expect, and not only because Ehrenreich appears (rightly so) just a few years away from being Han's age in the original movie. Not only that, but Solo's final act hints at him traveling to Tatooine to join up with Jabba the Hutt's criminal empire. But the years don't lie, and in Solo's final scene, there is still ten years to go before Han and Chewie are aproached by Luke and Obi-wan in the Mos Eisley cantina. For reference, this all means that Han was being born around the same time that the planet Naboo was being invaded by the Trade Federation in Episode I - The Phantom Menace. Fast forward to Han as a 19 year old on Corellia, and the same year that he and Qi'ra escaped the White Worms, Rogue One's prologue was seeing Jyn Erso orphaned. It also means that in the year that Solo teams up with Beckett's gang on Mimban, the Death Star is being moved from its construction site at Geonosis to Scarif (explaining why the planet is no longer a workable spot for the crew to process their score). Going a little further back in time, this timeline makes a slight tweak to what fans had assumed before. Where Han's birthdate was assumed to be somewhere around 29 BBY (before the Battle of Yavin in the first Star Wars), the new canon puts his birth year close to 32 BBY, and the actual age of Harrison Ford at the time of the movie. Hopefully, that clears things up. If you have any questions, leave them in the comments below and we'll do our best to answer.